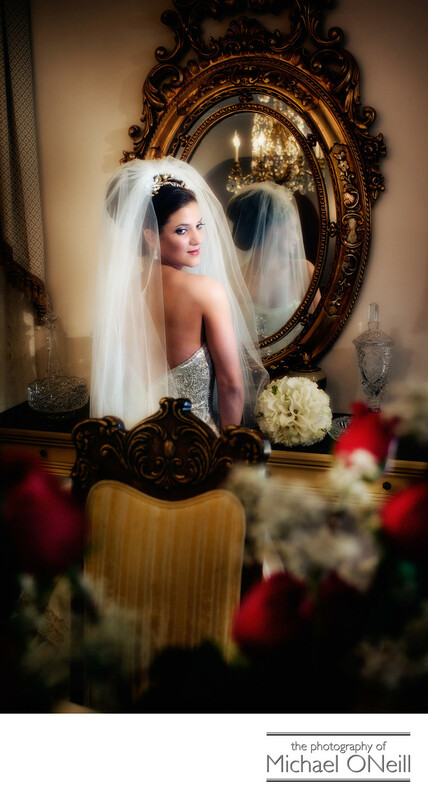 This beautiful bridal portrait was taken in the bride’s home in Manhattan Beach, New York, an upscale neighborhood located in Brooklyn just outside of NYC. The bride had just finished putting her gown on. Soon we would be leaving for church where her groom would see her in her wedding dress for the first time as she walked up the aisle with her father. I loved this mirror that was in the formal dining room in the house. On the dining room table in front of me stood a beautiful vase holding the dozen long stem roses that the bride’s husband-to-be had sent her that morning. I positioned myself on the other side of the roses and focused on the bride allowing her to be framed by the out of focus roses in the foreground. Later in the day we would travel to the reception venue, Marina Del Rey in the Bronx. That spectacular waterfront reception venue is located in the shadow of the Throgs Neck Bridge with outstanding views of the Whitestone Bridge and the New York City Skyline beyond.